Die neue Schrift Trola Text ist da – und stellt die ideale Ergänzung zur Trola Schriftfamilie dar. Es ist kaum möglich, ein und dieselbe Schrift für Headline und Mengentext zu verwenden, wenn man einen gewissen qualitativen Standart erreichen möchte. Trola Text ist eine neue Schrift, die genau an diesem allgemeinen Problem anknüpft und diesem entgegenwirkt. Sie wurde speziell für Mengentext entworfen. Wo sich Trola durch ihre ungewöhnlichen Proportionen auszeichnet und sich ideal als Headlinefont eignet, ist Trola Text speziell für kleine Schriftgrößen entworfen. In ihrer Anmutung perfekt zur Trola passend, wurden für die Trola Text einige Buchstaben überarbeitet und speziell für kleine Schriftgrößen angepasst. So macht die neue Trola Text die Schriftfamilie weitreichend einsetzbar und garantiert immer gute Lesbarkeit. Aus dem Pressetext: Because of it’s condensed proportions and the compact forms Trola is the perfect typeface for headlines and narrow columns where saving space is essential. But different reading modes (continuous, fragmented, variable speed, in movement, etc.) require typefaces with specific characteristics. The letterforms should be adjusted to the different optical sizes, not just in their form, but also in the spacing. It is because of this need that Trola Text is created. 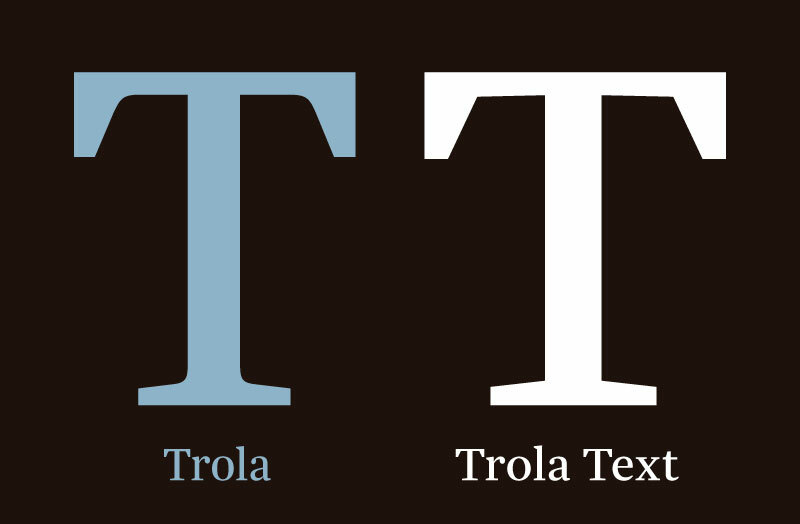 Trola Text’s specific adjustments for small sizes complement the range of uses of the Trola family, but still it is a font with enough personality to be used independently in text for continued reading. Trola Text characteristics result in a somewhat crisp texture, with an increased contrast, and a high level of legibility. Proportions in Trola Text are noticeably widen, particularly in the upper case, but also the serifs have been simplified, their construction is more robust, and the shapes are totally straight. White space becomes more prominent through a generous spacing and letterforms with larger aperture. A little increase in the curves tension in every character and a slight flare in the strokes, particularly evident in the diagonal shapes, add a pinch of warmth. Additionally, the lowercase had some inclination to the right, increasing the speed of reading in continuous readings.